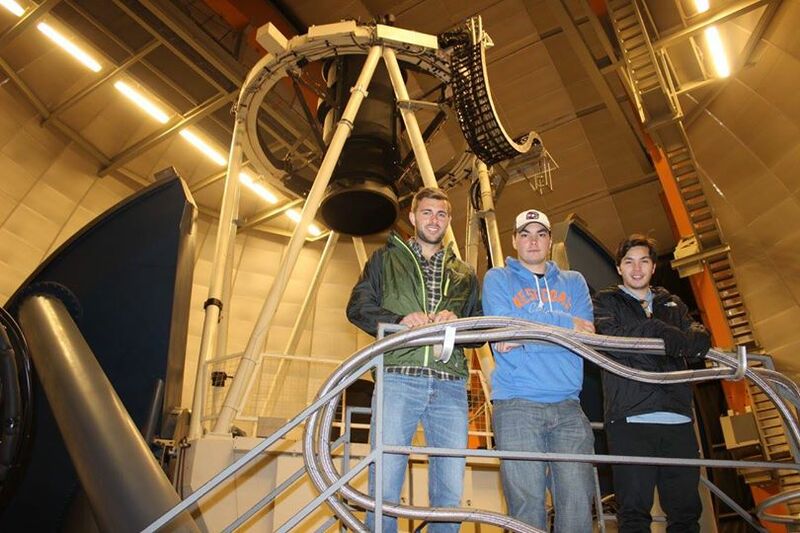 Congratulations to Ryan Hegedus (’17), Alan Vasquez (’18), and Paddy Clancy (’19), whose work on PSR J1400-1431, a new pulsar-white dwarf binary, was just published in the Astrophysical Journal. While observing in Chile with the 4.1-m SOAR telescope in June 2016, they responded to a request from collaborators to obtain a deep optical image of an area of the sky containing a pulsar that showed evidence of a nearby companion. The pulsar itself would be too faint to see at optical wavelengths, but the hope was that the potential companion might be visible. Indeed, the image they obtained (shown below) revealed an incredibly faint target — more than 3 million times fainter than what the human eye can see! The follow-up analysis, which also used data from the famous Keck telescopes in Hawaii, showed the companion is likely a very cool and low-mass white dwarf star. Published 2017 September 20 • © 2017. The American Astronomical Society. All rights reserved.